In 1986, Florida voters authorized a lottery through a constitutional amendment, enacted by a two-to-one margin that would use its proceeds to enhance public education in Florida. Governor Bob Martinez and the Florida Legislature established the Florida Lottery with the mission of maximizing revenues for education to allow the people of Florida to benefit from significant additional monies while providing the best lottery games available. Over the 31-year history of the Florida Lottery, both goals have been accomplished. Driven by the legislative mandate for tickets to go on sale by January 18, 1988, the Lottery's start-up was a year of dynamic activity. Rebecca Paul was hired as the Lottery's first permanent Secretary and on January 12, 1988, the Florida Lottery began sales of its very first game – six days ahead of schedule. A $1 Scratch-Off, the Lottery's first game, MILLIONAIRE, exceeded $95 million in sales – setting a lottery industry record. MILLIONAIRE was so successful that in just 17 days the Lottery was able to repay the original startup money	borrowed from the state's General Revenue Fund of $15.5 million plus interest. Lottery fever swept across the state, and the players enthusiastically embraced the new games, resulting in many ongoing favorites. The first Draw games, FLORIDA LOTTO® and CASH 3™, were introduced with a dual launch on April 29, 1988. 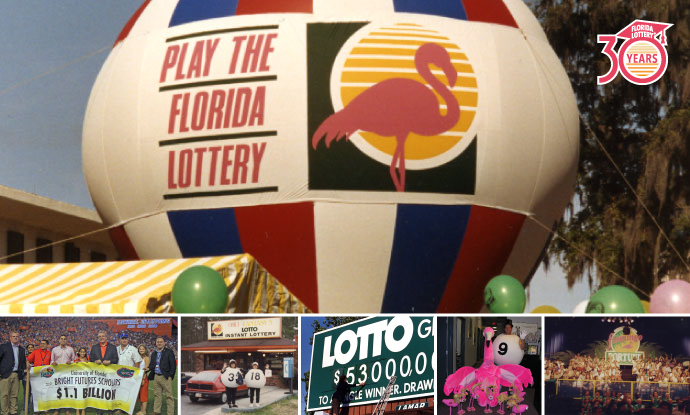 By August 31, 1988, the Florida Lottery had emerged as an industry leader when FLORIDA LOTTO produced an estimated $52 million jackpot, a new national and world record for its time. As the Florida Lottery continued to respond to its growing player base, FANTASY 5™ was launched as a bi-weekly game in April 1989 and PLAY 4™ was added to the daily games in July 1991. Finally, MEGA MONEY™ was introduced in 1998. In July 2008, the Lottery announced that it would join the Multi-state Lottery Association (MUSL) and launch POWERBALL® in early January 2009. The instant-win game LUCKY LINES™ launched in October 2010 and ended prior to the launch of MEGA MILLIONS® in May 2013. In July 2014, the Lottery replaced MEGA MONEY with the Draw game LUCKY MONEY™. On August 1, 2016, two new twice-daily Draw games were added to the lineup, PICK 2™ and PICK 5™; CASH 3™ and PLAY 4™ were renamed PICK 3™ and PICK 4™, respectively, to complete the new daily game product line. On February 17, 2017, the Lottery started selling the regional multi-state game CASH4LIFE®. On September 1, 2017, the Florida Lottery launched the instant-win game Fast Play. In January 2019, the Lottery replaced LUCKY MONEY with the Draw game, JACKPOT TRIPLE PLAY™. The Lottery's portfolio of Scratch-Off games has also grown through the years to offer players a myriad of themes with a variety of instant prizes. Millions of Scratch-Off players have collected prizes ranging from free tickets and merchandise, to instant cash prizes up to $10 million. Players now have numerous entertainment options offering something to intrigue every player. The Lottery's Scratch-Off games include choices of tickets that now range from $1 to $25. At more than 13,000 retailer locations across Florida, players can continually choose from a wide assortment of approximately 60 different Scratch-Off games at any one time. Florida Lottery games have delivered what had been promised to players... "better games and more winning moments." As the Florida Lottery has grown into an industry leader, it remains a dependable contributor to education in Florida. More than a $1 billion in each of the past 16 consecutive fiscal years has benefited Florida students and schools statewide, representing approximately six percent of the state's total education budget. While the Lottery was never intended to fully fund Florida's education system, Lottery contributions are far-reaching and crucial to ensuring the future success of students in Florida. Pre-kindergarten projects have directly affected the youngest Florida citizens, while thousands of K-12 students reap the benefits of Lottery dollars every school day. Thousands of bright minds have followed the beacon offered by Florida's Bright Futures Scholarship Program and other student financial aid to pursue opportunities in higher education at state universities and community colleges. These institutions of higher learning themselves have benefited from more than $6.3 billion that help keep them running and affordable to Florida students. Additionally, Lottery dollars have funded School Recognition and Merit Programs for improved schools, and have even helped build and renovate nearly 800 schools through the Classrooms First and Classrooms for Kids programs. In total, Florida's schools and students have received more than $35 billion in Lottery profits, including more than $5 billion to send more than 808,000 students to college on Bright Futures Scholarships funded by the Florida Lottery. Through the years, the Lottery has become part of the very fabric of Florida, truly affecting the lives of all Floridians and providing residents with a reason to believe their dreams can come true as millions regularly enjoy "water-cooler dreaming" with family and friends about what they would do if they won the big jackpot. Today, millions continue to show their support by purchasing billions of dollars in Lottery products per year. Whether they are winners who have collected million-dollar Lottery prizes, or one of the many who are able to follow their dreams by getting a better education with the help of Lottery dollars, all Florida residents enjoy and benefit from the Florida Lottery. With the patronage of its players, the dedication of its retailers and employees, and a state-of-the-art gaming system, the Florida Lottery will continue to ensure that players are provided with the best games in the industry and that profits continue to generate even greater contributions to education in the state. The best years are yet to come!